Frank Sinatra, one of the most notable entertainers of the 20th century, will be commemorated on a postage stamp next spring, Postmaster General John Potter announced Wednesday. "We've had a lot of requests for a Frank Sinatra stamp, certainly one of the great American icons, and to be able to feature him in our stamp program is a big thrill for all of us," Dave Failor, executive director of Stamp Services, told CBS News reporter Lloyd de Vries. 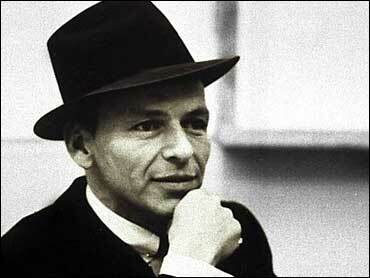 Sinatra died May 14, 1998. "On behalf of our family, we are honored that the United States Postal Service has recognized our Dad's achievements with a stamp," said Tina Sinatra, in a statement, on behalf of her siblings, Nancy and Frank Sinatra, Jr. "Of all the awards he has received, this one would have been very special to him." The design of the stamp will be released next Wednesday when a 10-foot image of the stamp is unveiled in Beverly Hills, Calif. Sinatra's three children will attend. The stamp design is a vertical format, and shows Sinatra in the mid-1950s. "It's a wonderful portrait by an artist who we've used before, Kazuhiko Sano, and I think people will be very happy with Ol' Blue Eyes," Failor said. Many stamp collectors had been surprised when the 2008 stamp program was first announced in August, and Sinatra wasn't in it, says de Vries. Bette Davis will be the entry in the Legends of Hollywood series; the Sinatra stamp is not part of any series. Most of the remaining designs for 2008 stamps will be released between Christmas and New Year's Day. The designs for Lunar New Year, Alzheimer's Awareness, Charles W. Chesnutt (Black Heritage Series), and American Journalists (including CBS News' Eric Sevareid and George Polk), have already been made public. A native of Japan, Sano studied painting in Tokyo before moving to San Francisco in 1974 to study at the Academy of Art College. He designed 12 of the 15 stamps in the Celebrate the Century series in 1999. When the stamp will be issued will depend largely on whether the Postal Service raises rates in the spring. "We want to time it so it would be at the new rate, as not to issue it at the old rate and only be able to have a very short shelf life of say a month or two," Failor said. The release is likely sometime in May or June.